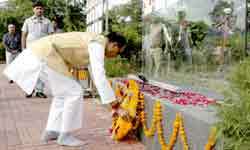 Bhopal : Chief Minister Shri Shivraj Singh Chouhan paid tribute to the Martyrs at Shaurya Smarak on the occasion of concluding day of First Anniversary of Shaurya Smarak today. Shri Chouhan reached Shaurya Smarak in the morning and paid floral tribute to the Martyrs who sacrificed their lives during the Indo-China war. These Martyrs include eighteen soldiers from Madhya Pradesh. Principal Secretary Culture Shri Manoj Shrivastava and other Eminent Citizens were present on the occasion.